According to statistics, almost $17 billion is spent on flooring in the United States on an annual basis. If you’re one of those people who have a high-end floor in their home or at their place of work, you know it requires a great deal of care and attention. Wooden floors require extensive aftercare in order to retain their color and aesthetic appeal. There are certain ways in which you can take care of your wooden floor. Some people use oil while others prefer to use wax. Most people prefer wax when it comes to taking care of their wooden floors. A major reason for this is that it is easier to apply. 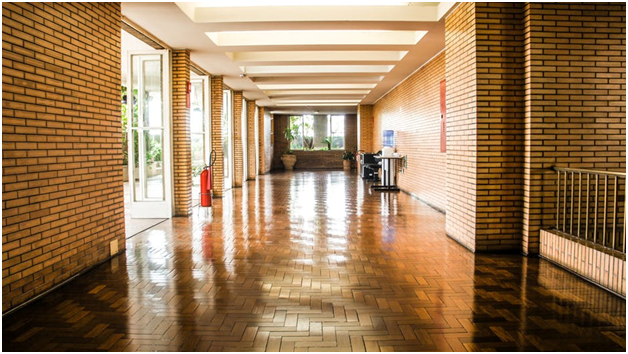 A major benefit of waxed floors is that they do not require any kind of seals. Unlike oil and Polyurethane, wax does not require restoration and as a result, homeowners are able to save a great deal of their money. When it comes to waxing the wooden floors in your place of residence, you need to know that you would require a buffing machine. You will need to use it multiple times throughout the year in order to make sure that your floor is well maintained. In such situations, it is better to opt for the services of professional cleaners who have the expertise when it comes to using the latest equipment and machinery. How often do you need to apply wax? A major benefit of wax aftercare is that over time, the amount of wax you require will decrease. When you first use wax, in order to care for your wooden floor, you may need to wax and buff the floor two or three times within a year. However, after a certain period of time, the wax will harden after which you will not need to apply it on the floor unless it starts looking dull. When it comes to mopping waxed floors, use a neutral cleaner. Instead, it is better to use vacuum cleaners and soft brushes. If you really need to clean the floor, it is better to use microfiber pad. Make sure that you don’t over wet the area. Always wipe up spills immediately, if left they can lead to stains on the floor. Cleaning aggressively can remove the layer of wax. You need to take measures to always make sure that there is a layer of wax on the floor. A great number of people prefer to wear shoes indoors. Placing a mat at the entrance can help absorb the moisture from the shoes. Take off your shoes when you enter your house. In addition to that, homeowners also need to make sure that they do not apply too much wax to the floor. There are certain areas of your home you do not use that often. Avoid too much wax in that area since it can lead to a buildup of wax.